Oak Park, IL -- The Legacy of the Tuskegee Airmen Continues: The Eyes Above The Horizon Event promises to inspire minorities interested in Aviation. At-risk youth from all over the country are encouraged to participate. Minorities make up about 2% of all aviators. Pilots are in demand. The Legacy Flight Academy seeks to increase those numbers by exposing minorities and at-risk youths ages 8 to 18 to careers in aviation. On April 21, 2018 the LFA will host "The Eyes Above The Horizon". Participants will fly in a single engine airplane, receive instruction in basic aviation principles, and explore the STEM Principles incorporating Science, Technology, Engineering, and Mathematics. Active and retired military and civilians are always encouraged to join our organization through volunteer opportunities, and corporate sponsors and donations help us fund our year round programs. On April 9th, 2018, the LFA is hosting their annual fundraiser #Tuskegee99 which seeks donations from 99 supporters to donate $99 on the 99th day. 100% of proceeds go towards tuition, camps, manuals, supplies, and scholarships and is tax deductible. The LFA is a 501(3)(c) non-profit organization that conducts character-based youth aviation programs that draw upon the LEGACY of the Tuskegee Airmen. 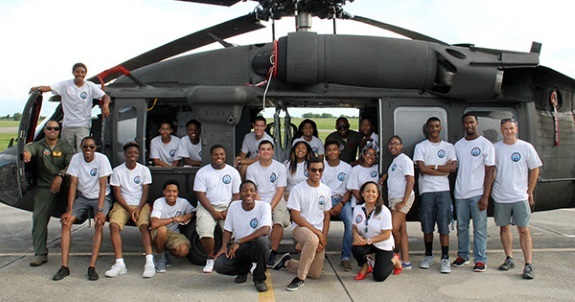 Their program helps minorities and at-risk youth achieve success as aerospace professionals, particularly emphasizing military career opportunities. Labels: Minorities make up about 2% of all aviators. Pilots are in demand.